No Middle Eastern feast is complete without hummus. This Ramadan make yours stand out from all the other generic recipes with this coffee scented Hummus, your guests will thank you! Soak the chickpeas overnight to rehydrate. Bring a large pot of water to the boil, add the Bicarb and the chickpeas and simmer till soft. Drain the chickpeas and rinse in cold water to cool down, place them in a food processor with the garlic, tahini and ice and blitz till smooth. Dissolve the Knorr Lime Seasoning in the 90ml water. While food processor is running slowly add the lime juice, olive oil and then the coffee. Check the seasoning and add accordingly. Cover with plastic foil and store in the fridge till ready to serve. Sauté Lamb Mince with garlic and Knorr Chicken Stock Powder until lamb becomes crispy. Preheat an oven to 170°C. In a bowl mix together the flours and sesame seeds. In another bowl mix together the olive oil and water. Slowly incorporate the wet ingredients into the dry to make a soft dough. Flour a work surface, divide the dough into quarters and roll it out very thin (it should be almost see through). Transfer to a baking tray and brush with extra olive oil and scatter over the salt. Bake for 15 minutes until golden brown and crisp. Use a tablespoon to put small amounts scattered on the plate, using the back of the soon pull through the humus. Break shards of the crispy breads and stick them in the hummus. 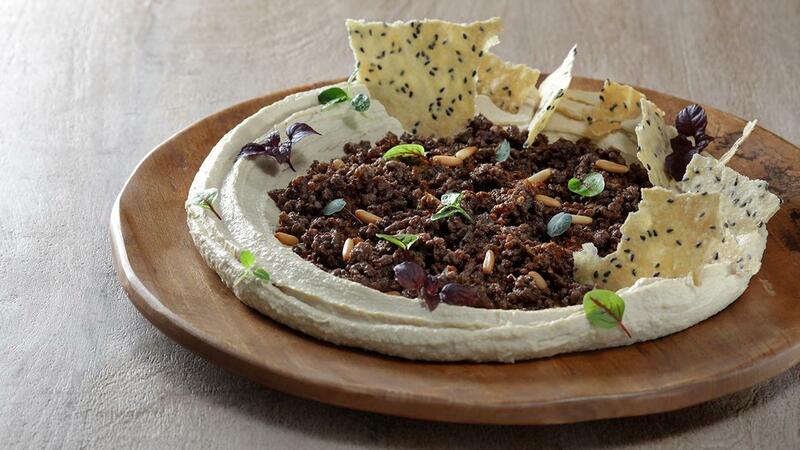 Scatter cooked lamb on top of hummus. Finish with some mint sprigs and a pinch of sumac.